Richard Sopris led an expedition into the Roaring Fork Valley to explore for minerals in the 1860's. 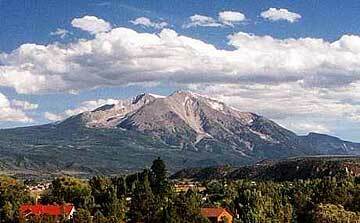 Mount Sopris (elevation 12,953 feet) was named in his honor. I am Lt. Colonel (Ret.) Fred Tietbohl, 3rd generation American from my 2g grandfather Joachim Tietböhl 1815 of Demmin, Prussia and my 4g grandfather Capt Jesse Sawyer 1750 of the American Revolutionary War, and Ethan Allen's Green Mountain Boys. Travel and recreation, Genealogy, Digital Photography, and Amateur Radio W0IXQ. This site is dedicated to photo slide shows of some of the more remote areas in the state, a slide show of a Colorado River rafting trip, and family genealogy including memorial pages for departed family members. compatibility view. This will exist until an update is made.